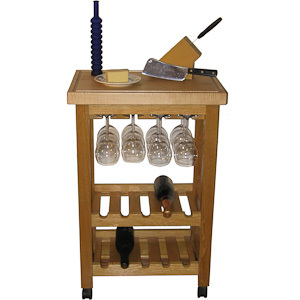 This beautiful ten bottle wine rack and combined cutting board is perfect for those wine and cheese parties. It's mobile so it can be easily positioned wherever you are entertaining. The glass holder supports 12 large burgundy style wine glasses or 16 smaller fluted style glasses. The cutting board, made from Rock Maple will withstand cutting of cheese and meats with ease. The board is coated on all sides with a non-toxic sealer designed for cutting boards to protect the surface. A drip edge is milled around the perimeter of the cutting board to hold any meat juices. Select the wood choice for the frame.